Surveillance images of suspects in four separate thefts at a Berkeley Apple store. 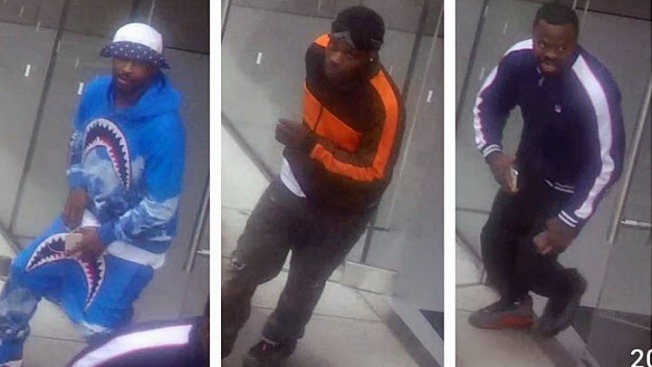 Police in Berkeley are looking for three men suspected of robbing the same Apple store four times in the past week. The suspects have stolen tens of thousands of dollars worth of electronics from the Apple Store at 1823 Fourth St., according to Berkeley police. The first two robberies occurred March 28, once at 10:05 a.m. and then again at 3:16 p.m., police said. In those robberies, the thieves made off with $1,200 worth of items in the morning and three laptops in the afternoon. The third hit came at 7:33 a.m. April 1 and resulted in $15,000 in stolen items, police said. The next day at 11:33 a.m., the suspects returned and made off with $5,000 more in stolen items, said. Video surveillance cameras in the area captured three men believed to be connected with the thefts, police said. Anyone with information about the crimes should contact the Berkeley Police Department's Property Crimes Unit at 510-981-5737.